My name is Bonnie, and I work in the Lizard Lab as a research technician. In my job, I feed the lizards we keep in the lab, use a microscope to measure cells in the muscles of our lizards, and work with college students on their own projects in the lab. I love my job because I get to work with beautiful and interesting animals while learning lots of things about lizards and about science. 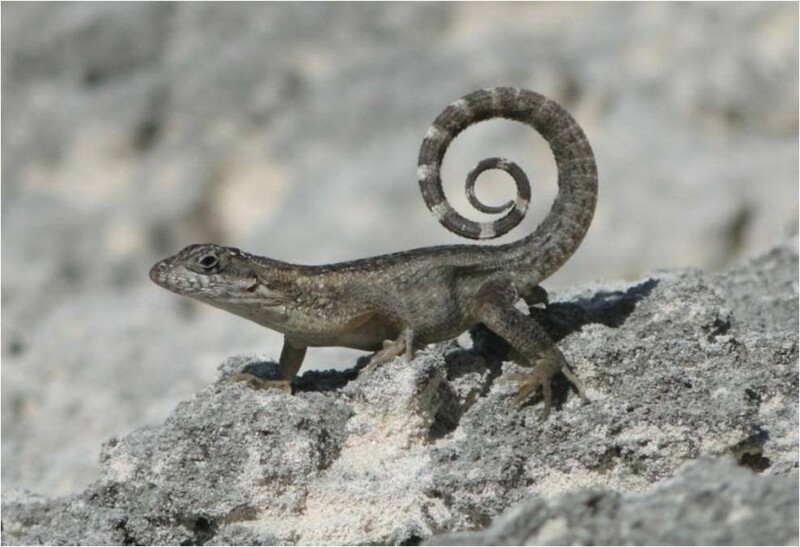 One of my favorite species of lizards lives in the Bahamas and has the nickname “curly-tail” because it sends messages to other lizards by curling up its tail into a tight spiral (see the picture above). These lizards use their tail just like the green anoles Michele described in her earlier post use their dewlap. Curly-tail lizards not only have a unique way of communicating, but they also have an interesting diet: they eat flowers that grow on the beach! While Michele, Chris (a student in the lab) and I were studying curly-tails this summer on a small island in the Bahamas called Crooked Island, we saw these lizards eating morning glory flowers and running around the beach with the flowers in their mouths (see pictures below)! Even though curly-tails also eat insects like most other lizards, it was exciting to learn that these lizards eat something unexpected. Why do you think curly-tail lizards eat both plants and insects, instead of eating only insects like most of the lizards we see here in Texas? Have you ever seen a lizard or any other animal doing something that surprised you? Let me know what you think about these cool lizards in the comment box below. I’d love to hear about your own interesting lizard observations! Whenever I hang out on my porch in S. Florida a big curly tail comes and sits right by me on the table. Lately I will give him small pieces of kiwi which he now takes right from my hand. He pretty much runs the whole patio…3 apartments wide. Once he gets his treat he either hangs out and stares at me or runs back to his “house”. I’ve seen these curly tails at the Cape Canaveral library Florida. I’m use to the anole lizards so I was really blown by their tails. I’ve heard that they may have gotten there by the cruise ships that cruise to the Bahamas. We have snow weed in our backyard. Certain times of the year when it’s in bloom the curly tails eat them up. We have at least 4 in our backyard. Oh, BTW we live in South Florida.